“A Woman Captured” is an engrossing, maddening film. It bills itself as a story about modern-day slavery, following 52-year-old Marish who finds herself trapped in contemporary Hungary serving a vile master named Eta. (The film premiered at Sundance 2018). Visually, the film reflects Marish’s small world via unwavering extreme close ups. It’s enamoring, because her visage, like that of an old-world gypsy, is haggard and telegenic. The result is intimate and raw. Initially at least, I’m on board for the ride. Marish’s quest is believable, which she announces early on: to escape from her situation, get her own place, and reunite with her 16 year-old daughter. Where this film breaks down is the accumulating sense that Hungarian filmmaker Bernadett Tuz-Ritter is withholding vital information. After all, some 69 minutes pass before we see anybody besides Marish! Throughout Act 2, I have an increasingly strong sense that I’m being manipulated. There’s no back story forthcoming. As a result, the early rush of being immersed in Marish’s suffering is subsumed by a realization that everybody—Tuz-Ritter, Marish, and Eta—all have a lot more facts than I do. We’re deep in Act 3, minutes before the over-the-top conclusion, before we learn bits and pieces about how Marish arrived in her current situation. This is way too late. What about Marish’s relationships? Is she estranged from her husband and children? If so, why? And for how long? And did this precede her descent into “modern-day slavery?” …Come again, does Marish really have 5 adult children nearby?! Alternatively, perhaps this film is actually an experiment, testing my own expectations for more backstory and exposition? Is the joke is on me? Is this a postmodern work of art? Is it a fiction film in documentary clothing? A third possibility is that Marish is actually suffering from some sort gargantuan lack of confidence that entraps her at an emotional level. How else can you really explain that she’s simply unable to walk down the street to seek help from one of her children, or a work colleague, or a social service organization? If this is the case, wouldn’t have Tuz-Ritter tried let us in on this gradually during Act 2? Some sort of revelation that Marish’s health or choices have played a role in her current situation? Cue Act 3. When Marish calls the “institution” where her daughter is staying, she gets through to the director easily and talks with him at length. She obviously has a pre-existing relationship with him. What is this institution? Where is the daughter? What’s the backstory there? Most important, the conclusion is an emotional house of mirrors. Tuz-Ritter builds up Marish’s reunion with her daughter as the emotional peak of the film. But for this to matter, I need to understand what circumstances caused their separation. But the explanation is insufficient and I’m frustrated. After the film, I talk with several Sundance filmgoers around me. Most of them love the film. They want to discuss modern-day slavery and how horrible it is. 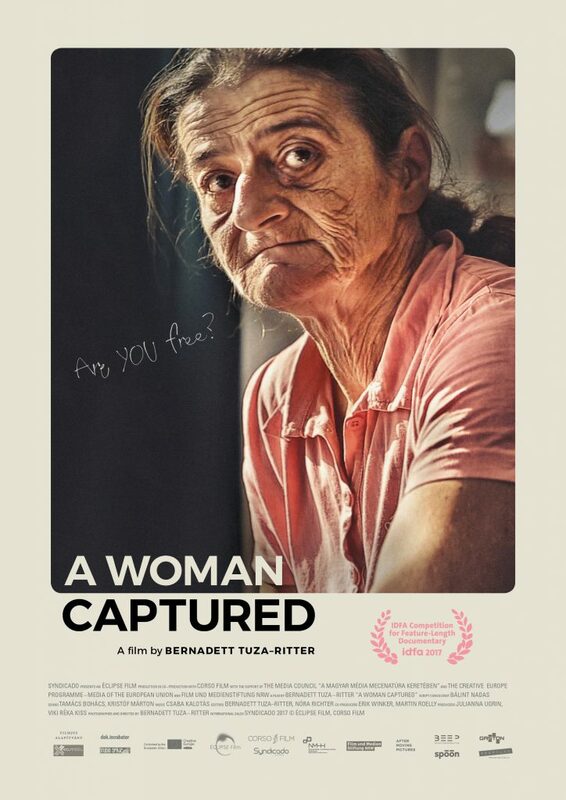 But for me, “A Woman Captured” has the trappings of a film—an interesting character, an underlying quest, a structure and a resolution of sorts—but ultimately, it is manipulative gibberish. Without exploring in greater depth why Marish’s family doesn’t help her escape, then the film isn’t honest or authentic. The Hollywood Reporter piece called “A Woman Captured” “more conspiratorial than observational.” I suppose that’s spot on. And it raises a vital question: at what threshold of conspiracy does a documentary film cease to be a documentary film? For more Los Angeles documentary film production, click here. Philip Glass fans, apologies in advance, but his score just ruined a movie that could’ve been great. 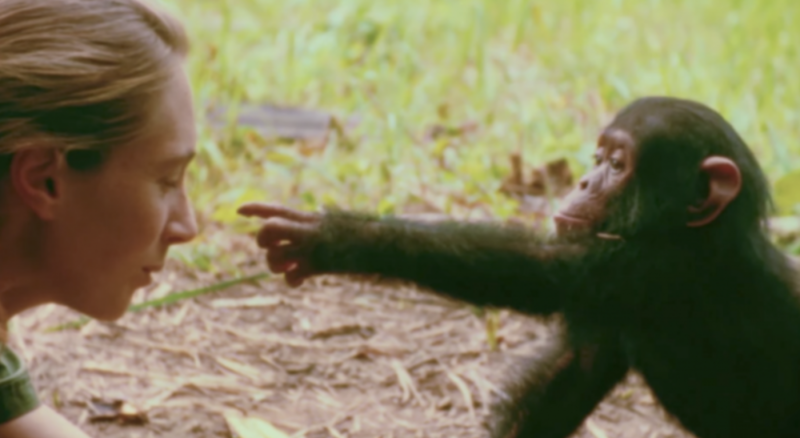 Arriving at the Palm Springs Film Fest on Friday, I was eager to watch Jane, director Brett Morgen’s new biopic on the legendary primatologist and conservationist. It promised new insights into her revolutionary work in 1960s Gombe, Tanzania through 100 hours of newly rediscovered Super-8 footage (misplaced for a half-century in some dusty Nat Geo closet?!) And not just any footage—stuff shot by Ms. Goodall’s former husband, the renowned wildlife cinematographer Hugo van Lawick. Morgen does an incredible job with what I imagine was exceedingly difficult footage. Super 8 doesn’t have an audio track, but you wouldn’t know it from watching the picture. Every whisper of wind; every action by every chimp—from David Graybeard to Flint—seems natural and keeps you in the moment. Kudos to the entire sound department! The director really draws out Ms. Goodall, who is a tough interview. I know, because I’ve worked with her several times (I write about the experience here and here). Morgen’s stylistic decision to light Ms. Goodall’s interview to match the film’s passage of time is incredibly daring. It reveals an intense preparation: he knows where in the film he’ll use her answers before he poses the questions! When you watch the film, the interview space is bright early in the film, but dark toward the end. Wow! And the visual effects that jazz up Ms. Goodall’s journals are astonishingly well done. The animations—staccato visions of her research—suggest persistence and knowledge accumulating. During these montage segments, Glass’ music works well, because it propels the the animations forward. It’s not competing with human reflection or emotion. Great FX job by Stefan Nadelman! Going in, I was keen to hear the Glass score. I’ve been a big fan of his since Errol Morris’ 2003 The Fog of War: Eleven Lessons from the Life of Robert S. McNamara. In fact, that soundtrack was one of my inspirations for the music in my 2012 film Shattered Sky, composed by the talented Steve Steckler. But a big difference is that The Fog of War is more cerebral, a film of ideas. The disjointed visuals really benefit from the cohesiveness of a dominant soundtrack. Alternatively, Jane has a strong protagonist who is in the frame driving the action. She’s on an unforgettable quest. Van Lawick’s cinematography transports you to the pinprick of emotion. 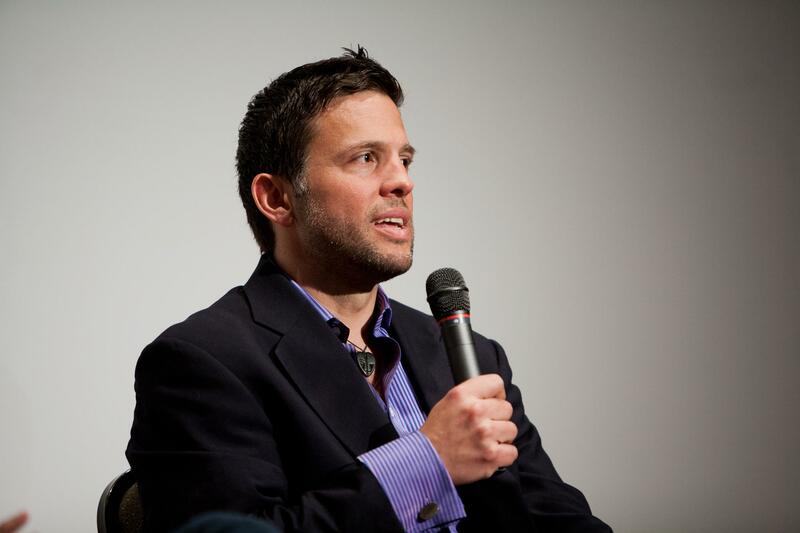 All of this creates a strong sense of character, time, and place—the foundation of a potentially powerful documentary. So when the score kicks into high gear barely 10 minutes in—before Ms. Goodall really achieves anything—it doesn’t work. It is premature. Rigidly metronomic, an orchestra of strings plopped down right there in the middle of the forest in 1960’s Tanzania, the music highjacks the story. Glass’ score, for me, is excessively masculine, and relentlessly propulsive. Does The Fog of War music fit Robert McNamara? Yes. But that’s because he’s a hard-charging, ambitious business executive and Secretary of Defense. He’s caught in a political machine and the music’s repetitive structure mimics McNamara’s foolhardy forward-press during the Vietnam War. But Jane couldn’t be more different. Admittedly, Ms. Goodall is an icon, and maybe that’s why National Geographic drew Glass into the project. One icon to shed light on another. 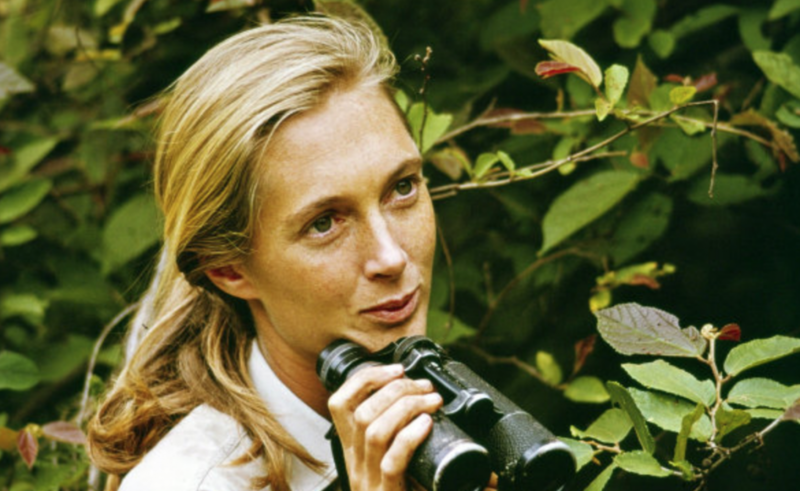 But this film chronicles Ms. Goodall’s first days, when she is an unknown. She is brave yet vulnerable, and she’s afraid her approach will not work. Glass’ music belies that uncertainty. The music’s early peak precedes Ms. Goodall’s success, which feels manipulative. The confident fullness of the orchestration seems inconsistent with her solitary project during these early stages. And the surety of the repetitive structure betrays her slow progress. Morgen is one of the best documentary storytellers out there working today. I just wish he would’ve let Ms. Goodall, the chimpanzees, and the Tanzanian landscape sustain the story. It would’ve been a better movie for it. 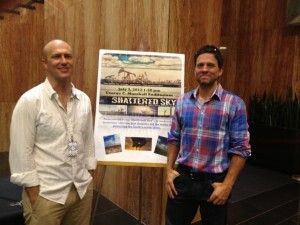 It was a great way to celebrate Independence Day: a screening of Shattered Sky at the U.S. State Department on Tuesday. It was an honor, given the history of the institution and the role its employees played during the ozone crisis. George C. Marshall auditorium welcomed us: the “Marshall” in “Marshall Plan.” Dan Evans and I fielded a bevy of smart and challenging questions following the show: about climate policy, the interplay between regulation and technology, the importance of citizen action. In 1985, 20 countries signed the Vienna Convention to set up a framework for negotiating international regulations of ozone-depleting substances like CFCs. Chief U.S. Negotiator Richard Benedick (who is in our film) must have walked these State Department halls and had lively debates with his team. How would they set the tone for global cooperation on a future global treaty? Less than two years later, following the discovery of the ozone hole, Benedick and the EPA’s Lee Thomas led the American presence at the important signing of the Montreal Protocol, where 24 countries formally committed to phasing out 50 percent of CFCs. Subsequently, the Montreal Protocol got updated seven times, and more than 190 countries eventually signed it. And they all phased out 100% of CFCs. For me, that’s the main lesson on climate. You don’t have to get it 100% right at first. Gather up the main players, take an important first step. Then update the plan together. Don’t let the perfect be the enemy of the good. We’re coming up on the 25th anniversary this September. Hopefully, more of us will take notice that in 1987, America led the world to a global solution on the ozone crisis. Will we will all take inspiration to take smart action on climate? Only time will tell. Since the March 22 premiere of Shattered Sky at the DC Environmental Film Festival, it’s been a whirlwind of good: NY Times coverage and lots of contacts with festivals, colleges, and activists who want to play the film. Most importantly, our Shattered Sky team is growing, and setting a solid foundation for a campaign to make a huge impact on the issues come September – the 25th anniversary of the Montreal Protocol, the international ozone treaty. The festival was super. Expertly run, our screening was super packed. We had Sunshine Mendez moderating, with Rolling Stone editor Jeff Goodell joining Dan Evans and me on stage for the panel afterwards. We had a private reception at the nearby Hotel Rouge following the panel, with about 100 people. National Wildlife Federation CEO Larry Schweiger talked about the educational partnership with Shattered Sky. I’m personally really excited about this, and will write more as it continues to take shape. The outreach will focus primarily on high school and college. It will be national. It will be a combined science and civics curriculum. And it will focus on the positive message that America led the world to a solution on the ozone crisis during the Reagan Administration—and we can do it again on energy and climate. If you’re on Facebook, you can see the photos of the film, the vibe, and the party. It’s been a crazy month, but has exceeded all my expectations. Thanks to everybody for all you’re doing to get our campaign going. You know who you are! Got word today that Volcanic Sprint was accepted into the Boulder Adventure Film Festival that goes from November 6-8, 2009. Great time today in sweltering Houston, where a pocket of film-lovers and runners came to a showing of Volcanic Sprint organized by Real Films. The Aurora Theater, an inspired second act for a 1920s church, is intimate, with a wood-paneled ceiling and walls. The Q&A goes an hour, with people interested in Cameroon’s situation almost as much as the particulars of the race. And with Saint Arnold Brewing Company a sponsor, the night is complete. Jeff Mills and his wife Barbara are founders of Real Films (and principals of Houston’s own IO Communications). Not only did they put on a classy event, but they made me feel right at home — if only for a day in Houston. Jackson Hole Film Fest Rocks! I have to admit that this film festival is killer! Not only did the programmers get some amazing films here, but all the organizers are relentlessly nice, and have created a very low-key atmosphere for us to just hang out and meet each other. In between watching amazing documentaries like “Class C” and “Man on Wire,” I hobnobbed with a lot of very inspiring people — including a sizable DC contingent. 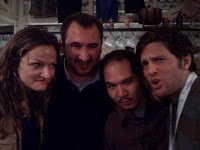 Here, from left, are Virginia Williams, producer of Frontrunner; Karim Chrobog, director of War Child; Brian Liu, director of Disarm (which won its category in the 2006 Jackson Hole Film Fest); and yours truly. Cool festival. Jackson Hole, Here we come! Leaving today to attend the fifth annual Jackson Hole Film Festival. Volcanic Sprint is playing there on Friday and Sunday. Volcanic Sprint won first-place today in the non-fiction category at the 38th annual USA Film Festival held in Dallas, Texas. Volcanic Sprint played at the DC Independent Film Festival today. It was preceded by two other short African-issue films produced by Western filmmakers. Co-producer Dan ducked out at the credits, so I flew solo for the Q&A. Later, we met up with some friends at Roger Miller Restaurant in Silver Spring for some Cameroonian food. Good to catch up with owner and friend Emmanuel Bobga. Almost as soon as I finished Volcanic Sprint last year, I imagined having a public viewing where we shot in — in Buea, Cameroon. It would need to be free and in the open air. I pictured it showing in the dirt in-field where the Mt. Cameroon Race begins and end, at Molyko Stadium. Tonight, it happens, and the Buea Post Weekender edition publicizes it well. Moki, Dan, and I say a few words on stage, then Volcanic Sprint plays. As many as two or three thousand people attend, stretching back beyond the track to packed stadium bleachers. I sit crossed-legged in the dirt and watch them watching, blue light flickering on childrens’ expectant faces. Buea’s children: watching their neighbors, their heros, dance upon the big screen. Volcanic Sprint won the Showcase Award for Best Outdoor Mountain Activity Film at the Big Bear Lake International Film Festival today. 4-7 and November 1-5, 2007, respectively. Today, we get word that Volcanic Sprint was accepted into the 16th Annual Hot Springs International Film Festival. Good times. Video on Sustainable Cities: One Minute of Happy! From our studio in Washington DC, Dorst MediaWorks helps US-based international organizations with inspiring, documentary-style videos.